58010 • Tamiya Ligier JS9 Matra • (Radio Controlled Model Archive) • RCScrapyard. Released by Tamiya on November 30, 1978, this RC model, based on the alloy plate F1 chassis, is of the Ligier JS9 Matra, that was proudly introduced by Ligier in the same year at the Monaco Grand Prix. 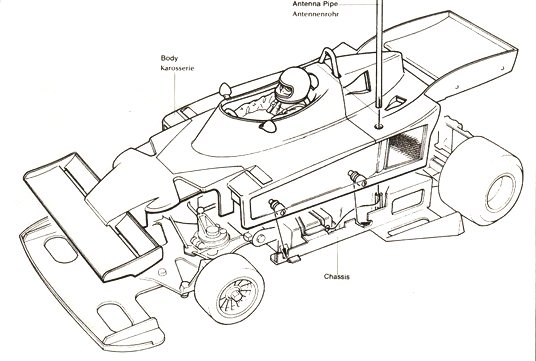 This new innovative F1 car displayed an extended rear wings with wide side pontoons. The front of the car had a sloping pointed nose, all of which improved the aerodynamics of the model. Although classed as a 1:10 scale car, the model was based on a 1:12 pan chassis incorporating a floating radio deck and a cast metal motor pod for the under powered RS-380S motor. 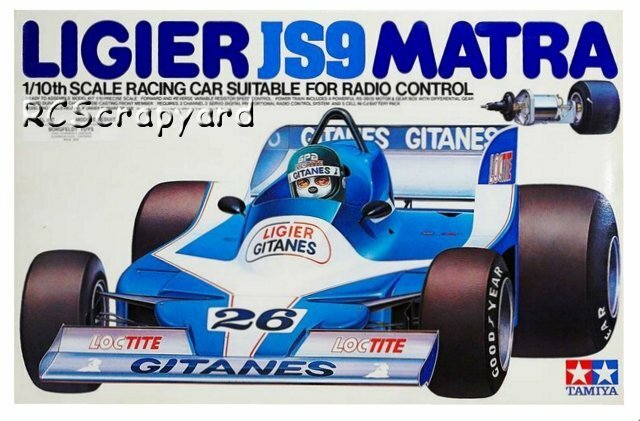 The sleek lines of the Ligier JS9 Matra ABS hard plastic body shell model has made it a favourite with Tamiya collectors and is much sought after for the display cabinet.